Attorney Itamar Ben-Gvir and Right Parties Union to be heard tomorrow before Supreme Court judges least likely to accept their petition. The Supreme Court will hold a hearing on Wednesday on the petitions filed on Monday by Attorney Itamar Ben-Gvir and the Right Parties Union appealing the Central Elections Committee Chairman decision not to allow the list to be changed. 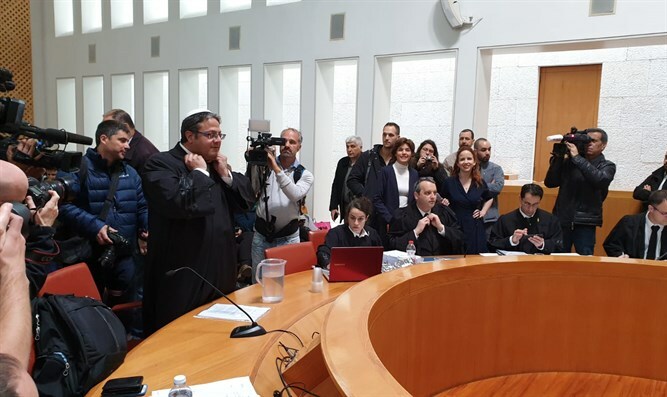 Attorney Ben-Gvir and the Union requested to change the order of the candidates following the Supreme Court decision to disqualify the candidacy of Dr. Michael Ben-Ari, who had been in fifth place on the list. On the basis of the request that Justice Hanan Meltzer rejected, Otzma representatives would be assigned to the places saved for the list in the first place. Attorney Itamar Ben-Gvir would be in fifth place on the Right Parties Union list, while Yitzhak Wassarlof would be in eighth place. The three judges appointed to hear the petitions are considered the most conservative in the Supreme Court: Noam Solberg, Menachem Mazuz, and Alex Stein. The composition of judges does not bode well for the petitions, since in order for them to be accepted a creative interpretation of the law must be employed, one contrary to the usual manner of Judges Solberg and Stein. National Union Chairman MK Bezalel Smotrich commented on Twitter, "Who said the Chief Justice has no sense of humor? The judges for the petition demanding the list be changed after Ben-Ari's dismissal: Solberg, Mazuz, and Stein. This is a petition that requires a chock full of judicial activism to be accepted. So it's the conservative appointments by Ayelet Shaked who will reject it and absorb the criticism from the Right. It's only a shame the joke is again at our expense."